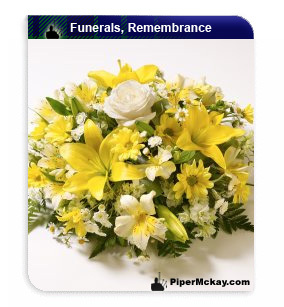 Piper Mckay plays comforting Scottish and Celtic tunes from Slow airs, Marches and Laments for Funeral Remembrance services. Piper Mckay arrives as seen here. Note: This a professional service, not a scruffy, squeaky / screeching looking and sounding experience like many. 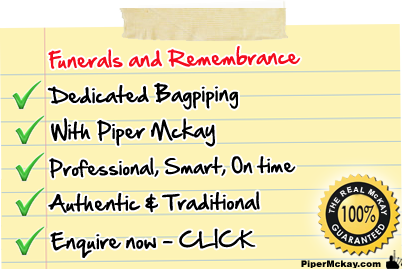 Piper Mckay is an official supplier to leading reputable Funeral services, agencies and individuals. Just a quick note to say firstly it was a pleasure to meet you at James' funeral and thank you so much for your time and services that day. It was an honour for us to have you there. Thankyou so much for today, I felt like you took my nan home. You looked amazing and I loved how you followed the car after the service. Thankyou so much for adding a touch of class to such a sad day. My nan would of been so happy. Your whole immaculate image and presence, coupled to your superbly played Pipe music, was very much commented on by everyone during Dave's Wake, and coupled to numerous associated compliments such as "One of the most moving funerals I have ever attended", and "The very special touch of the lone Scottish Piper Mckay and his beautiful wafting music, was the absolute pinnacle of Dave's gorgeous Funeral and Final Farewell". Many thanks again Martin for your genuine sheer professionalism. You are very special. I hope that we might meet again in the future, but perhaps, in a happier and less sad environment. Sincere thanks to you from all our family in making the send off for our Father so special. 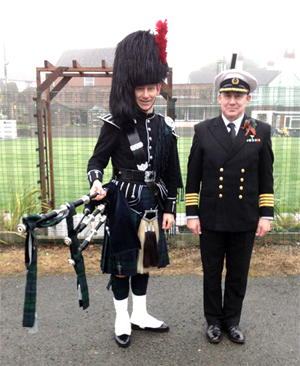 The sound of the pipes was perfectly fitting and we thank you for helping with this special part of the day. As I sit here this evening going through the memories of today at laying my Dad to rest I want to thank you all so very much from the bottom of my heart on what a fantastic service you gave my Dad today in honouring his memory. The family were totally overwhelmed with the piper today. We were so proud of our heritage at listening to the music played. Well done and a big thank you.